Photos by Brandon Macz: Washington Army National Guard Col. Adam Iwaszuk talks about the redevelopment potential for the Interbay armory during an open house at the Ballard Eagleson VFW Post in Ballard on Tuesday, March 19. People came by to ask questions and write down what they'd like to see replace the armory. Washington Army National Guard Col. Adam Iwaszuk is confident the Interbay Public Development Advisory Committee will have a recommendation report on the governor’s desk by November. Gov. Jay Inslee formed the committee after the Legislature passed a proviso last year to assess the greatest public benefit for the National Guard’s Interbay armory site. The armory was built in 1974, and is now considered deficient under current guidelines for what are now called readiness centers. Iwaszuk said the Interbay Public Development Advisory Committee is comfortable with the National Guard pursuing relocation to a 25-acre site in North Bend, but that still requires state funding to purchase the land from Puget Western Inc. 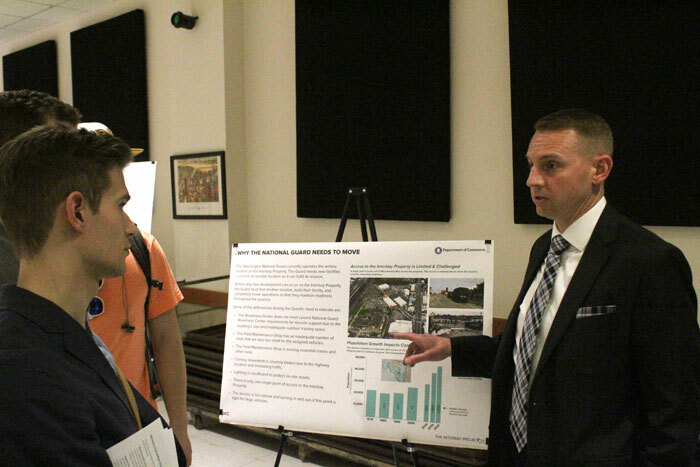 The lingering question of what to do with the armory site if the National Guard does receive relocation funding was posed to the public during the first open house for developing the report on Tuesday, March 19. 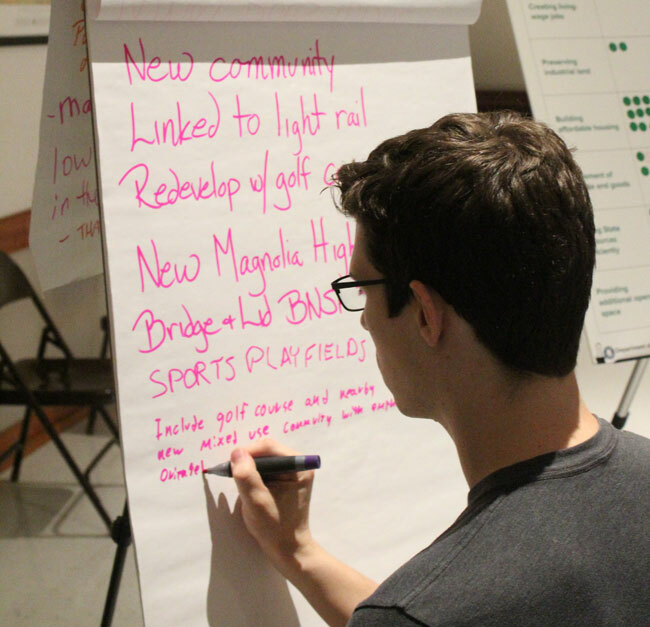 People had the opportunity to ask questions about the property and relocation proposal, and to write comments regarding what they’d like to see happen on the 26-acre armory site at 1601 W. Armory Way. The Interbay Public Development Advisory Committee had its most recent meeting on March 13, where about six options were discussed, three of which Iwaszuk feels would be most attractive to the community. “I definitely want to see some level of housing,” said Andrew Lewis, an assistant city attorney running for the District 7 city council seat, who attended the open house. The site is near an arterial street — Elliott Avenue — and near future light rail service. “What more could we want for housing,” Lewis said. The District 7 candidate said he’d like to see a portion of the site support more light industrial business in Interbay, which he thinks could be the next Georgetown. “I would entertain possibly housing, but I worry very much that it’s a liquefaction zone and it’s near the train tracks,” said Don Harper, a retired small business owner who is also running for District 7. If housing were considered for the site, he said, light industrial could act as a buffer near the tracks. Magnolia Community Council member Will Stafford believes the site could receive a contract rezone to accommodate affordable and market rate housing, commercial and light industrial development. He attended the March 13 committee meeting. “They showed in their scenarios that it is doable,” he said. Iwaszuk said he’s in favor of affordable housing, park and open space, light industrial and commercial uses on the armory site. “The plan I pitched is, let’s make it a hybrid; a little bit of everything,” he said. The armory site is in a liquefaction zone, Iwaszuk said, but structures can be supported with underground pilings like those used on the existing armory buildings. There is a field maintenance shop on the site, which requires frequent inspections for fuels and other possible contaminants, and no issues have been noted previously. Frank Gibson, a contracting specialist for the Military Department, said more soil testing is being done this month. “We can’t turn the property over without a full, clean environmental assessment,” Iwaszuk said. The property can’t even be marketed until the National Guard has moved into a new readiness center. Iwaszuk said there can be no down time that would affect guardsmen’s ability to operate. While a funding request by Iwaszuk to the Office of Financial Management was denied, he said, the Legislature could still budget for the purchase of the North Bend site this session, which would mean funds could be available by July. The Interbay armory may seem quiet during the week, but there are about 660 that report there for weekend and annual trainings. National Guard members at a facility at Boeing Field would join them in North Bend, Iwaszuk said, for a unit totaling more than 800. The Interbay Public Development Advisory Committee is set to meet again from 9 a.m. to 12:30 p.m. Wednesday, May 8, at the National Guard Armory. A second open house is scheduled for 6-8:30 p.m. Wednesday, May 15, at the Ballard Eagleson VFW Post, 2812 NW Market St.
A final open house is planned for Oct. 1, where details of the report to be delivered to the governor will be shared.